Market analysis firm Comscore has released its rankings for Internet search engines during September of 2010—and the news is that very little has changed compared to August. Google saw a bit of an uptick, Yahoo saw an equivalent downtick, and everyone else saw almost no change at all in the proportion of U.S. Internet searches they handled. However, controversy is again brewing behind the scenes as search engine companies—Yahoo in particular—object to the way metrics outfits like Comscore measure traffic. According to Comscore, Yahoo saw a 0.7 percent dip in the number of searches it handled in September compared to August, while market leader Google saw a 0.7 percent increase in the number of searches it handled. Unsurprisingly, Comscore puts Google way out in front of the search marketing, handling some 66.1 percent of all U.S. Internet searches. Yahoo retains its number-two spot handling 16.7 percent of U.S. Internet searches, while Microsoft came in third with an 11.2 percent share, up 0.1 percent for the month. However, the landscape represented by Comscore’s figures is significantly more complex for September than in the past. September marks the first complete month that Microsoft’s Bing has provided the behind-the-scenes infrastructure for Yahoo’s Internet searches. So, in a way, Bing now accounts for 27.9 percent of U.S. searches…and that’s beginning to mount a serious challenge to Google’s dominance of the search market. (However, Google also provides back-end search facilities for Ask.com and AOL, so debatably they could pick up another 6.1 percent from their fourth- and fifth-place rankings.) Comscore is accounting for these partnerships using “Powered By” reporting, which counts partner searches that are explicitly branded as being handled by Google or Bing under their totals. According to Comscore, that means Google powered 69.1 percent of U.S. searches in September, and Bing powered 23.5 percent of U.S. searches for the month. Comscore also says its figures reflect “explicit core driven search,” meaning that searches generated in context-dependent ways independent of user intent aren’t figured into the totals. In a nutshell, that means comScore says it is now adjusting figures to account for Google Instant, which provides dynamically-updated search results as users type. 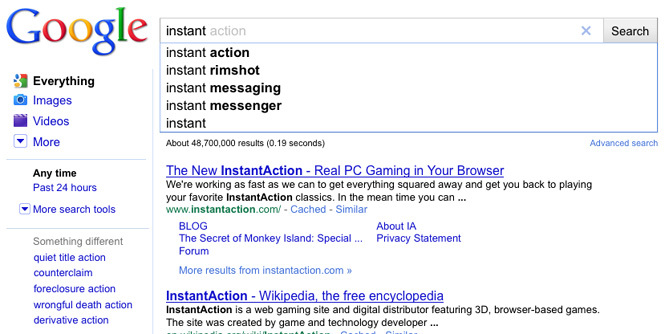 Comscore says queries generated by Google Instant without users’ clear intent aren’t included in its total.